Oftentimes, a small bathroom can be made to feel more spacious and useful with some layout changes. Think about the day-to-day use of your current bathroom. What frustrates you about it? Figuring out what areas of your current bathroom annoy you the most can help you and your home improvement contractor plan a customized layout that will ensure you get what you want out of the bathroom remodel. Knowing the pain points of the current room will also help you and your contractor narrow down options for other elements of the remodel like fixtures, lighting, and other upgrades. A wall-hung sink or pedestal sink can open up your small bathroom, especially if you don’t need to have expansive counter space. If you’re still feeling cramped with a pedestal sink, you can get even more creative and reposition your sink to fit in a corner. Depending on the overall layout of your bathroom, this could allow you to have some more counter space and add some under-the-sink storage without taking up too much floor space. For smaller bathrooms, the toilet likely doesn’t take up too much space overall. Remodeling these bathrooms to feel more spacious often only requires some tweaks to the bathroom layout and a few upgrades. But, when it comes to a really small bathroom, the toilet can take up a lot of available floor space. Commercial wall-hung toilets take up less space and are easier to clean around, but they are very noisy. However, a residential wall-hung toilet with a hidden tank might be the perfect solution for remodeling your small bathroom. These are quieter than their commercial counterparts while still offering all of the same benefits. Standard or outdated shower and tub combinations can take up a lot of real estate in a small bathroom. When you start thinking about remodeling your bathroom, consider whether you actually use the tub. If you do, there are plenty of shower and tub combinations available to help you maximize your available space more efficiently. If you don’t use the tub, consider exchanging your shower and tub combination for a walk-in shower unit during your bathroom remodel. This often uses less space and, even if it takes up the same amount of space, makes your small bathroom look and feel more spacious. The right lighting can be the finishing touch that makes your small bathroom look and feel more spacious. A textured glass block window can allow light in while also providing privacy. Recessed lighting can illuminate the room without protruding from the wall or ceiling. A large vanity mirror may take up wall space, but it provides a reflective surface to help illuminate the room further and make it feel more spacious without taking up available floor space. Bathroom remodeling can help turn your current small bathroom into a more comfortable and functional space. 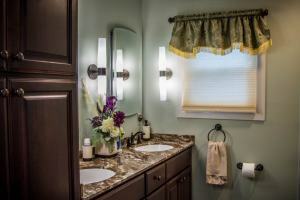 For help with your next bathroom remodel, contact Zephyr Thomas at 717-399-4708.